Painting reveals those moments of infinite possibility, by choosing the path of the unknown. 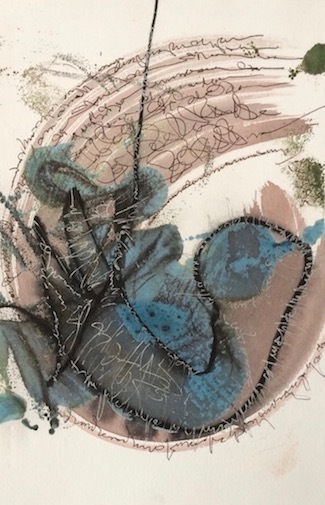 Visual poetry and asemic (language without semantic content) are seeing without looking, writing by not reading, and moving with intuitive intent. Asemic language negotiates neural pathways of a language I do not know, allowing thought to be lost in order to find that place in the brain where language has its origin. I have only recently found a place in my oil paintings for asemic language. In the end, the paintings will be what they are meant to be. Jeanette is a contemporary artist who lives and works in Albuquerque, New Mexico. She has a BFA degree in Dance from the University of New Mexico. Jeanette moved to NYC in her 20’s and was influenced by the minimalist movement and the power of the human form. Considering life as performance art and without regret she to took a hiatus to support and raise her children. She is a Registered Nurse and has a Masters degree in Midwifery, and with the same intensity of bringing a new life to the world, she brings intuitive thought into her paintings. Jeanette’s work has been exhibited in Albuquerque, NM at the NM Art League, Hardwood Art Center, New Grounds Art Gallery, Masterworks of NM, Ghostwolf Gallery, 606 Art Gallery, and the Yucca Art Gallery. She has also shown at SAM Susquehanna Art Museum in Pennsylvania, and in Mexico at Centro Cultural Casa Baltazar. She exhibits online as part of the Women Asemic Writers, www.intuitiveartists.com, utsanga.it, and Newpostliterate.blogspot.com.